While you’re waiting for me to start blogging, I thought I would publish a few of my “Saving (composer’s name)” series that I wrote for the Community MX blog some years back. This fourth one is about “Saving Orff”. If you haven’t seen the Carlton Draught Big Ad yet, you won’t want to miss it. Very clever, and what makes it particularly affecting is the music, which is not an original ditty composed by a writer of music for commercials. In fact, it’s another classical music rip off, this time Carl Orff’s chorus “O Fortuna” from Carmina Burana. My husband tells me that years ago another beer company used the same music in its ads. Well, why not? Carmina Burana is probably the most famous piece of vocal music of the twentieth century. It is very dramatic and stirring, and it does what all commercials seek to do: gets your attention. Being a good little proselytizer for classical music, this kind of thing delights me. If you read my last “saving series” blog piece, you’ll remember that I talked about movies and classical music rip offs. Commercials are another great source of getting good music into the collective conscious. I’ll take it any way I can get it. How many kids now know Aaron Copland’s “Hoe Down” from Rodeo because of the “Beef: it’s what for dinner” commercials? And don’t forget cartoons. An entire generation of kids learned the classics by watching cartoons. I remember a particular favorite: Bugs Bunny playing Franz Liszt’s “Hungarian Rhapsody No. 2” while a mouse inside the piano ducked the hammers LOL. Though not as many kids’ cartoons feature classical music these days, I was amused to see a “Hey Arnold” episode that featured Bizet’s Carmen. 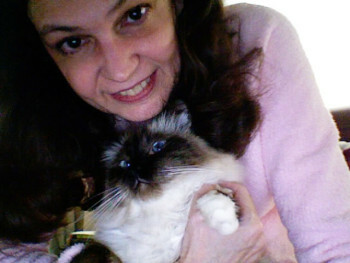 Here I am with my Seal point Birman cat. You can adopt your own cat at Siamese Cat Rescue Center where I volunteer as an interviewer who matches humans with the perfect cats.